When I first began grad school, I thought that becoming an English professor would be my dream job. I envisioned teaching as like running my own literary salon, with me giving lectures to a bunch of witty and contemplative students lounging around my living room, as we all sipped wine. Most importantly, we would deeply connect with and commune over the authors we not only studied, but adored. And in my spare time, I would do my own writing – creative writing, not academic writing, of course . . .
After getting my Ph.D. from Brown, I landed a contract position in a small university town in the backwaters of Nova Scotia. As I stayed up late struggling to generate enough lecture material to teach my three courses of 30-60 students each, on topics as diverse as Chaucer, Woolf and the history of cinema, while desperately trying to publish in refereed journals in order to make myself more competitive for tenure-track jobs, it quickly became clear that my fantasies of the Ivory Tower had been delusive. Of course, it didn’t help my mood much that it was a struggle to have anything resembling a love life in this town so homogenous that I kept being mistaken as a Chinese exchange student (and the one guy I did date kept referring to me as “exotic”). But to be fair, by this point, grad school had already jaded me by burying whatever creative spark had once lain dormant under an avalanche of “isms.” Feminism, New Historicism, Post-Colonialism, Marxist Cultural Theory – these were the schools of thought through which we were taught to understand and critique literature. Although I’d learned to talk the talk and throw around fancy jargon that no one (including myself) understood, deep down I always felt like a phoney. This wasn’t how I truly read literature. I knew on a rational level that the study of literature wasn’t supposed to be about communing with the heroes and heroines of books as if they were real people – fantasizing a fulfilling career for Lily Bart and speculating about what would have happened if poor, lonely Thoreau had met the woman of his dreams, for instance. I knew that this way of reading for emotional gratification was jejune at best, and yet this seemed to be exactly the way that I naturally read, the way that I had always read since childhood. That literary characters could be like friends had given me such comfort and consolation during my youth and turbulent adolescence, when I wasn’t asked out on dates and endured a painful spinal illness. After two years of being a prof, I found myself utterly burnt out and on the verge of a breakdown. I moved home to Toronto into my parents’ house, feeling like a colossal failure, to rethink my life and search for a new career. Not surprisingly, I found myself reading again – not reading like an academic, but reading like a reader. I wanted nothing more than to recover my childhood love of reading and I felt that if I could do that, the other components of my life – my dismal career prospects, my messed up love life, my family full of dark secrets – might somehow get better. Although it wouldn’t be that easy of course, I felt the first glimmerings of something like happiness. 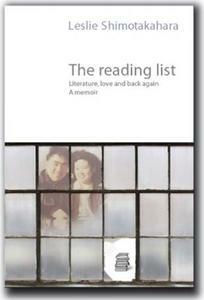 A few years later, as I was reflecting back on that dark period and writing my memoir The Reading List: Literature, Love and Back Again, it occurred to me that it might be interesting to write not only about my own breakdown and gradual recovery, but also the way that reading for pleasure had affected someone dear to my heart, who had been experiencing his own crisis at the time. My father. During that time, my father asked me to put together a reading list, a list of my favourite novels that would introduce him to the world of literature. Recently retired and desperate for any diversion from the fact that my grandmother was dying, my dad was intent on taking up reading as his retirement hobby and who better to ask for a reading list than his erudite, over-educated daughter? As we began reading through the list together – authors as diverse as Thoreau, Woolf and Atwood – the intriguing thing was how much I learned about my dad. Talking about books pushed him to talk about himself and his childhood growing up in the aftermath of World War Two, when Japanese-Canadians were still considered traitors, and I found myself unearthing a mine of dark, deeply buried family secrets. Not only did our reading list help me understand my father and our family past for the first time, it gave me just the material that would inspire me to write and realize my childhood dream of becoming a writer.